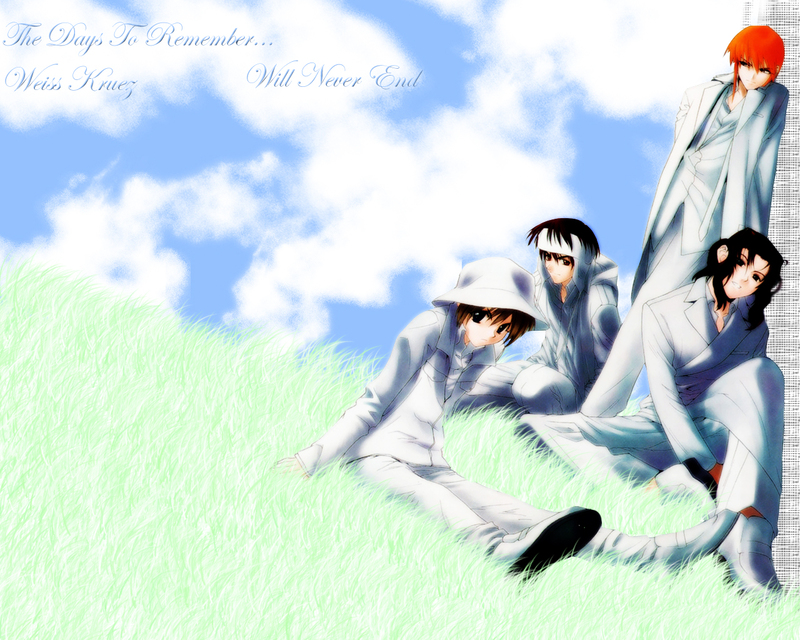 Weiss Kreuz Wallpaper: The Days to Remember..
Minitokyo »	Weiss Kreuz Wallpapers » Weiss Kreuz Wallpaper: The Days to Remember.. I dont knoe if i uploaded this already but enjoy.! Very peaceful and calm I like the idea a lot and the grass looks good and suits the whole wallie because it's very bright and it needs light green grass!!! not a badd a ideea but teh colors aren't strong enough and the grass field looks a bit empty. So smooth and really a nice idea! The chara sit in the grass >_< really well done but the grass may need more work :sweat: The whole wall is really cool and pretty with nice choice of color ^^ Nothing more to comment here, keep it up!